NBC’s wasted opportunity: The “Commander-in-Chief” forum was a complete bust | "Global Possibilities"
On Wednesday night, NBC hosted something they called the “Commander-in-Chief Forum.” It was a back-to-back set of interviews with Hillary Clinton and Donald Trump that, in the hands of a capable and incisive interviewer with a firm grasp of national security issues, might have provided us with a rigorous public examination of the two presidential candidates’ qualifications to serve as the civilian commander of our armed forces. But we didn’t get that. Instead, we got Matt Lauer. 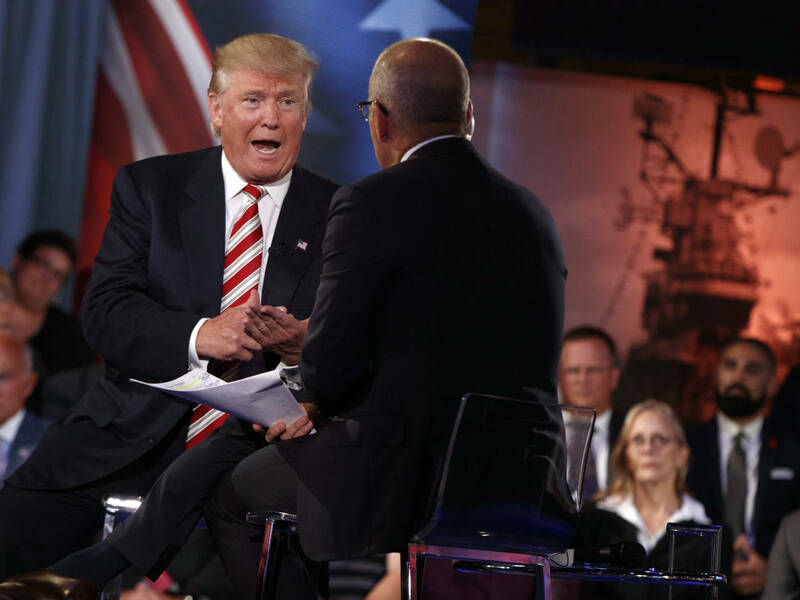 I’ll start with Lauer’s handling of Trump, given that the Republican candidate has an especially insane and ignorant view of foreign policy that demands precisely the sort of aggressive pushback that Lauer did not provide. Early on in his portion of the forum, Trump declared “I was totally against the war in Iraq.” That was a false statement. It’s been debunked several times over by various different media outlets. The moment he said it, NBC News’ senior political editor tweeted that Trump was lying. Hillary Clinton had even made a point of bringing up Trump’s 2002 interview supporting the Iraq invasion during her portion of the forum (which preceded Trump’s). Talking about the Iraq war, Trump repeated his nonsensical position that we should have taken Iraq’s oil as payment for having invaded the country. “I’ve always said, shouldn’t be there, but if we’re going to get out, take the oil,” he said. Lauer prodded a bit, asking how we were going to take the oil. “We would leave a certain group behind, and they would take various sections where they have the oil,” Trump said. A competent interviewer would have recognized immediately that Trump had no idea what he was talking about and pressed him for more detail. Who is “a certain group?” What does “take various sections” mean? What the hell are you talking about? Trump attacked Clinton for backing military action in Libya, which Trump himself also supported. Trump attacked Barack Obama for withdrawing American troops from Iraq, even though Trump backed troop withdrawal as well. Lauer didn’t say a word in protest. There were no questions about Trump’s recently fired campaign manager and his shady, likely illegal financial ties to a pro-Russia political party in Ukraine. There were no questions about Trump’s insane posture on nuclear weapons, or his intention to reinstate torture as official policy of the United States, or his enthusiasm for committing war crimes. 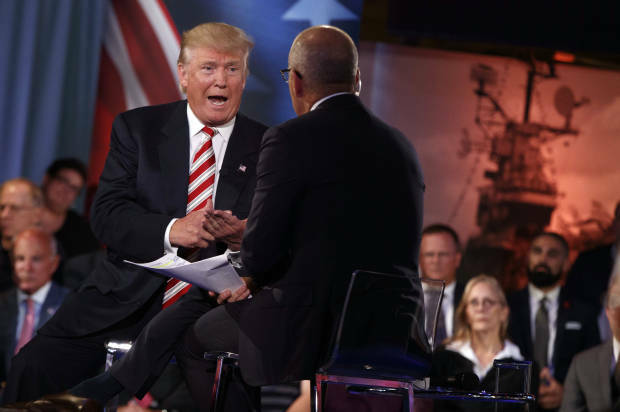 Lauer did ask, however, if Trump felt he was “prepared” to be commander-in-chief. Trump, you’ll be shocked to learn, said yes. As for Hillary Clinton’s portion of the forum, it wasn’t handled much better, nor was it any more enlightening. There were the requisite questions about Clinton’s email server, which resulted in the Democratic presidential nominee spending several minutes discussing the particulars of email headers used in official government communication. After burning his first few questions on email protocols, Lauer prodded Clinton to respond “as briefly as you can” to a question from a veteran in the audience about her threshold for using military force. Lauer ended the interview by asking Clinton if she could “guarantee people that after four years of a Clinton presidency, they will be safer on the streets of San Bernardino or Boston than they are today.” Hillary dodged, and with good reason: no competent politician would ever make a guarantee against acts of violence. Only really bad politicians do stupid things like that. CLINTON: With respect to Libya, again, there’s no difference between my opponent and myself. He’s on record extensively supporting intervention in Libya, when Gadhafi was threatening to massacre his population. I put together a coalition that included NATO, included the Arab League, and we were able to save lives. We did not lose a single American in that action. Hillary’s contorted answer did nothing to address the questioner’s concerns and tried to have it every which way on the Libya fiasco. It would have been interesting to see Clinton pressed on this point, but that didn’t happen because, again, all we had was Matt Lauer.